If you have been looking for a reason to purchase the iPad tablet, yet variables like price and the current lack of 3G internet access have been holding you back, then you might want to consider speed being your deciding factor for purchase. Benchmarking has shown the iPad tablet to be twice as fast as the iPhone 3GS. So not only are application developers able to build apps for a larger screen with the iPad tablet, but now they have faster native processing speed to boot. And according to techtree.com, “Jon Stokes of Ars Technica pointed out last month that Apple A4 runs at 1GHz clock speed which is similar to that of Snapdragon. The Apple A4 processor is build on Cortex A8 generation ARM processor core and has three layers of silicon circuitry stacked one on top of other. These three layers include microprocessor core and two memory modules (DRAM). The higher DRAM boosts the performance of the iPad. David Carey, vice president of technical intelligence at UBM technologists, told The Wall Street Journal that the DRAMs used in the iPad read and write data in 64-bit chunks, one potential reason why reviewers have called the iPad “surprisingly fast”. In all, the iPad’s A4 SoC silicon has a nice combination of 1GHz CPU core and two DRM modules that write data in 64-bits. This means that you can expect the browsing experience to be faster and apps to run snazzier on the iPad. The iPad tablet has been a revolutionary device and has captivated the world even before Steve Jobs made his official announcement of the iPad late in February. With the iPad tablet being such a new concept, much like the iPhone was when it first came out, the development world is slowly but surely picking about the iPad specs. But with reports like this – the iPad tablet being twice as fast as the iPhone 3GS – I can’t help but thing that once again, Steve Jobs has released a product that will indeed revolutionize our lives and the way we use, and interact with, technology. The iPad tablet was officially release on Saturday. The first version of the iPad tablet was was the WiFi only version – meaning you can only access the internet from a WiFi hotspot. 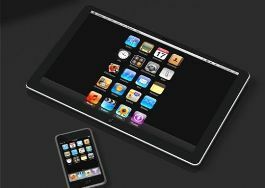 However, the iPad 3G tablet is expected to be released by the end of April, but there is no solid release date as of yet.